The latest buzz-word floating around the small-business world is “managed services,” and many are left scratching their heads as to what it means. It’s a term every company needs to look into, and it’s stirring a bit of a revolution in the business world. Here’s a quick run-down of what managed services can do and what to look for. For the most part, any service or program sent and administered over an Internet connection can be considered a managed service. A service provider distributes the software via its web servers, and the buyer doesn’t have to worry about running their own local servers, troubleshooting, or licensing — leaving more time to focus on company business rather than IT business. There are many different types of managed services. Google Apps for Business is a great example, placing all communications, documents, and collaboration functions on the web. Other examples would be online backup, which automatically archives files to a secure and off-site “cloud drive,” managed antivirus with the provider monitoring your security status, and patch management, where the provider keeps your software up to date. Managed services cost much less than buying software, servers, and administering things yourself. Typical small businesses do not have a dedicated IT staff, making software problems and installations very disruptive. Since managed services are handled automatically by web apps and a 3rd part staff, reliability and functionality is greatly increased. Google offers a host of programs including email, collaboration, and an office software suite for an annual fee of $50 per user. Google resellers can cost even less while adding in features such as migration options and support. Consider this cost compared to running a file server, Microsoft Office licenses, an Exchange server…hardware and software costs alone can run in the thousands of dollars. On top of this, maintaining, expanding, and troubleshooting have to be factored in. Google’s option puts the small business in a position to use scalable enterprise level tools at a much more affordable price. One thing to consider with managed services is the Internet connection. Business class DSL or better is required to run these services effectively. As a lot of information is transferred back and forth between your workstations, you’ll need to make sure you have the bandwidth to handle the increased traffic. Most service providers can review your connection specifications and make recommendations as needed. How much will managed services save? Savings come from not having to purchase physical hardware and software. For instance, a typical server can cost between $2000-$5000, and a company may require several servers. In addition, software such as Microsoft office can cost $200 per seat, and you’ll need backup hardware, security software, and payroll for IT staff to keep everything running. That’s a lot of money for something that is not to the primary focus of your business. 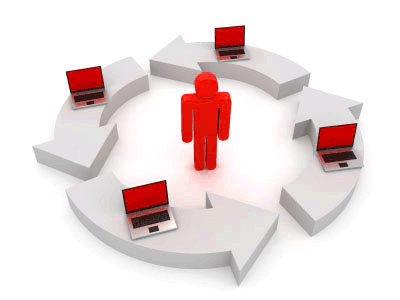 Managed services allow you to essentially “buy into” an existing system. Experts have set up a network and dedicated themselves to running the service, meaning you receive software that “just plain works.” The services are also scalable — you can add or subtract resources as needed without having to go through huge deployments. This is great for companies that hire temporary help and need workstation services for just a few months. You can add and subtract employees by simply contacting your provider, adding a lot of control to a business infrastructure as well as lower short and long term cash investments. Most managed service providers boast 99.5% uptime…and some even higher. That translates to a few hours of downtime per year. Of this downtime, most is typically caused by maintenance and performed in off-hours. Service providers will have backup systems in place and be able to anticipate system issues, as compared to a local server outage in an office that may result in hours to days of downtime in the event of a failure. Uptime does depend on your Internet connection, however. The service provider may be up, but you have to be able to reach them. A stable internet connection is key. Some service providers may recommend a second backup connection for redundancy. This depends on your connection track record and type of connection being used, but it is something to consider. When shopping for managed services, it is helpful to identify the problem you are trying to solve and it’s ramifications. If Sally’s workstation is used for accounting and keeps getting infected with viruses, the knee-jerk reaction is”Sally needs antivirus software.” However, infections usually find their way into a computer via security holes in web browsers. Also, what happens to the data on Sally’s PC if she does get infected? In addition to managed antivirus software, patch management and online backup would also be appropriate to give complete protection. You’ll want to make sure your provider spells out what they will handle, that way you will know exactly what each service covers. Uptime statistics are important as well. You don’t want your service going on in the middle of the business day for maintenance. Finally, check for hidden fees/charges. The provider should be up front about service pricing. Providers that nickel-and-dime you at every turn may be an indicator that you’ll want to look elsewhere. Manged services are very cost-effective and offer the small business a powerful platform on which to base itself. With value per dollar greatly increased, any business can now employ tools that were previously out of reach. This is leading to a revolution in efficiency and innovation as more resources can be used for growth instead of internal maintenance, leading to a boon in the small business segment. more on this topic? I’d be very grateful if you could elaborate a little bit further. Bless you!